Glen Campbell, the indelible voice behind 21 Top 40 hits including "Rhinestone Cowboy," "Wichita Lineman" and "By the Time I Get to Phoenix," died Tuesday. He was 81. A rep for Universal Music Group, Campbell's record label, confirmed the singer's death to Rolling Stone. During a career that spanned six decades, Campbell sold over 45 million records. In 1968, one of his biggest years, he outsold the Beatles. Campbell was born in 1936 in Billstown, Arkansas, the seventh son in a sharecropping family of 12 kids. "We used to watch TV by candlelight," Campbell told Rolling Stone in 2011. In his youth, Campbell started playing guitar and became obsessed with jazz guitarist Django Reinhardt. He dropped out of school when he was 14 and moved to Wyoming with an uncle who was a musician, playing gigs together at rural bars. He soon moved to Los Angeles and by 1962 had solidified a spot in the Wrecking Crew, a group of session pros. In 1963 alone he appeared on 586 cuts, and countless more throughout the decade, including the Byrds' "Mr. Tambourine Man," Elvis Presley's "Viva Las Vegas,” Merle Haggard's "Mama Tried" and the Righteous Brothers' "You've Lost That Lovin' Feeling." "I’d have to pick cotton for a year to make what I'd make in a week in L.A.," he said. "I learned it was crucial to play right on the edge of the beat ... It makes you drive the song more. You're ahead of the beat, but you're not." Fellow Wrecking Crew member Leon Russell called Campbell "the best guitar player I'd heard before or since. Occasionally we'd play with 50 or 60-piece orchestras. His deal was he didn't read [music], so they would play it one time for him, and he had it." In late 1964, Brian Wilson had a nervous breakdown on tour with the Beach Boys, and the band called on Campbell to replace him on bass and high harmonies. "I took Brian’s place and that was just ... I was in heaven then – hog heaven!" Campbell remarked. "He fit right in," said Wilson. "His main forte is he's a great guitar player, but he's even a better singer than all the rest. He could sing higher than I could!" Wilson even wrote an early song, "I Guess I'm Dumb," for Campbell. His first hit was a cover of Buffy Sainte-Marie's antiwar song "Universal Soldier." But Campbell's own political views tended to be conservative. "The people who are advocating burning draft cards should be hung," he said in 1965. Campbell had his first major hit in 1967, with "By the Time I Get to Phoenix," written by Jimmy Webb, an L.A. kid with a knack for intricate ballads. "Glen's vocal power and technique was the perfect vehicle for these, in a way, very sentimental and romantic songs. And I think that you know we made some records that were very nearly perfect. 'Wichita Lineman' is a very near perfect pop record," Webb said. "I think in the process that Glen was a prime mover in the whole creation of the country crossover phenomenon that made the careers of Kenny Rogers and some other... many other artists possible." The tune kicked off a working relationship that included the haunting Vietnam War ballad "Galveston," the tender "Gentle on My Mind" and "Wichita Lineman," Campbell's first Top 10 hit. With swelling orchestral arrangements and slick production, the songs weren't exactly considered hip in the Sixties. "They felt packaged for a middle-of-the-road, older crowd," said Tom Petty. "At first, you go, 'Oh, I don't know about that.' But it was such pure, good stuff that you had to put off your prejudices and learn to love it. It taught me not to have those prejudices." In 1967, Campbell won Grammys in both the country and pop categories. In the summer of 1968, Campbell guest hosted the Smothers Brothers Comedy Hour. 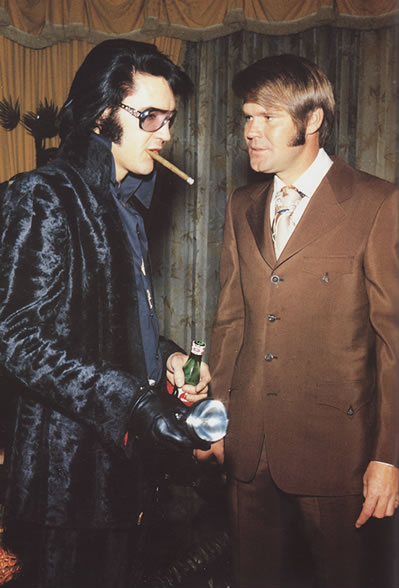 The successful appearance led to his own variety show, The Glen Campbell Goodtime Hour, which he hosted from 1969 until 1972. Artists like Ray Charles, Johnny Cash and Linda Ronstadt performed on the show, which also gave a national platform to rising country stars like Willie Nelson. "He exposed us to a big part of the world that would have never had the chance to see us," said Nelson. "He's always been a big help to me." Campbell's boyish charisma led John Wayne to cast him in a co-starring role in 1969's True Grit. He later said that his acting was so amateurish that he "gave John Wayne that push to win the Academy Award." But the good times didn't last: His show was canceled; his first feature film, 1970's Norwood, flopped; and the hits dried up for a few years. Then, Campbell scored a smash with 1975's "Rhinestone Cowboy." It began a comeback that included hits "Country Boy (You Got Your Feet in L.A.") and "Southern Nights." The hits slowed down again in the Eighties; in the Nineties he opened up the Glen Campbell Goodtime Theatre in Branson, Missouri. Campbell was married four times, and has five sons and three daughters. Despite his career successes, he struggled with alcoholism and cocaine addiction. In the early Eighties, he had a tempestuous, high-profile relationship with country singer Tanya Tucker, who was 22 years his junior. In 1981 he became a born-again Christian and in 1982 he married Kimberly Woollen, a Radio City Music Hall Rockette, who helped Campbell clean up his life. In 2003, he was arrested for hit-and-run, an incident that ended with him allegedly kneeing a police officer in the thigh right before he was released. Campbell pleaded guilty to extreme drunken driving and leaving the scene of an accident, and spent 10 days in jail. In 2011, Campbell, who was 75, revealed that he was diagnosed with Alzheimer's disease. In June of that year, he announced he was retiring from music due to the disease. He released his final album of original music Ghost on the Canvas (with guests Billy Corgan, Paul Westerberg and Jakob Dylan) and embarked on a farewell tour with three of his children backing him. "I think this has been really good for him," said his daughter Ashley. "Before the announcement, people were thinking, 'He's drunk. He's using again.' Now it's more of a supportive thing as opposed to an angry, critical thing." In 2014, I’ll Be Me, a film about Campbell’s farewell tour and struggles with Alzheimer’s was released. He spent his final years in an assisted living facility. His friends and children would often spend days with him playing him his old songs. "Music utilizes all of the brain, not just one little section of it," Kim noted. "Everything's firing all at once. It's really stimulating and probably helped him plateau and not progress as quickly as he might have. I could tell from his spirits that it was good for him. It made him really happy. It was good for the whole family to continue touring and to just keep living our lives. And we hope it encourages other people to do the same." Earlier this year, Campbell released Adiós, his final studio album, a collection of mainly cover songs by Bob Dylan, Harry Nilsson and others, recorded after his Goodbye Tour. "Almost every time he sat down with a guitar, these were his go-to songs," daughter Ashley Campbell told Rolling Stone Country. "They were very much engrained in his memory – like, so far back that they were one of the last things he started losing." Campbell was inducted into the Country Music Hall of Fame in 2005. Glen's soaring voice on the song ""The last time l saw her face"" lyrics by Gordon Lightfoot will bring tears to your eyes. Played many times on my cd player when hearing the sad news .Will be missed. One of the greatest talents there ever was. There were not too many who had the guitar skills of Mr Campbell. Recorded many iconic songs also. RIP. I wish that Elvis had reached the age of 81 yeaes. RIP Glen.